Glen Labuhan beach Guest House (Monkey beach) is situated between two jungle covered mountains comprising a sheltered 120 m length of beach, with dense rain forest and lake immediately behind. Some 80 % of the bay is coral rock, the home of uncountable tropical fish. The Northern end of the beach is sand, suitable for swimming out and snorkeling behind the coral. 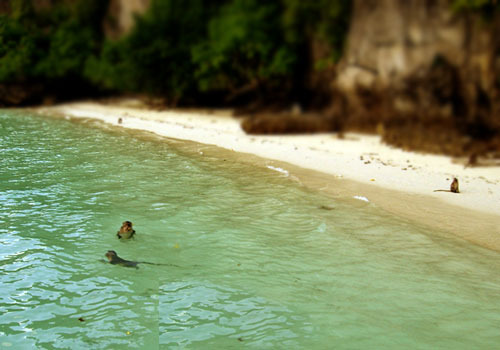 The beach has long been favorite picnic site of expatriates working in parts of Sumatra. The Guest House is on the Beach (within 15 meters of high water line), and overlooks the shoreline trees to islands of Northern tip of Sumatra. It is a first class private Guesthouse with family accommodations in a tropical paradise. Alternative accommodation (for Tarzan enthusiasts) is tree house, some few meters a long beach. All meals are inclusive.